What if The Who were on the Internet back in the day? In Sunday's Independent, two legendary album cover designers, Peter Saville and Sir Peter Blake, have pronounced that album art "is dead." Saville is famous for the iconic artwork of Joy Division and New Order, who he worked with extensively. He is also responsible for covers for Pulp, Suede and Roxy Music. "We have a social disaster on our hands," says Saville. "The things that pop music was there to do for us have all been done...there's nothing to rail against now. When I was 15, in the North-west of England...the record cover was like a picture window to another world. Seeing an Andy Warhol illustration on a Velvet Underground album was a revelation...It was the art of our generation...true pop art." Sir Peter Blake, who designed what is widely regarded as the most important album sleeve in history, for The Beatles' Sgt. Pepper's Lonely Hearts Club Band, says, "It [album art] survived from the LP to the CD, but...If that becomes obsolete then I guess album art won't exist. I think it would be a big loss." Even veteran keyboard player Rick Wakeman (no stranger to excessive fold-out album jackets) weighed in: "With downloads and everything...It's just killing the whole art side of music stone dead. To be quite honest, unless you have 20-20 vision it's very hard to read anything written on a CD cover. There was something very special about [vinyl] albums...It's a great shame." I admit, I understand what Saville and the others are articulating quite intimately. 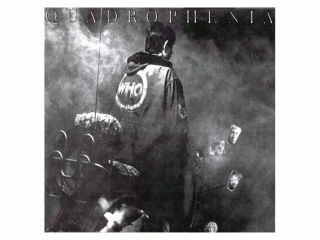 I remember what it was like to be a teenager and running home with my copy of Quadrophenia (which came with an elaborate and artfully done booklet detailing the album's themes), tearing the whole thing open and losing myself in the music and images. It was magic, it was special. Homework could wait, everything could wait - I had The Who and all these glorious photos. Exile On Main St. - I must've studied those dual jackets for hours, for days! And it even came with postcards with the band dressed in riverboat finery. Only a fool would actually rip them apart and mail them. Those were precious souveniers, meant to be stowed away for the ages. Conversely, what a bummer it was when you got an album - even a masterpiece - like Led Zeppelin IV - with only some photo of an old guy on the front and a Tolkien-esque painting on the inside. Grossly unfair - where was the band? But that was, as they say, back in the day. How would I have felt if I had the Internet and almost total access to my favorite bands on a daily basis? Exclusive photos, blogs, tour dates, streaming tracks, downloads, behind-the-scenes videos? Do you really think today's music lovers, a 15-year-old fan of Linkin Park, say, would be content with just a square piece of cardboard? I think not. Yes, the album cover is dead. But what we have now is, dare I say it, bigger and better. To have been a teenager and have the chance to download behind-the-scenes studio footage of The Who making Who's Next? Now, that would've been nirvana. You can't tell me otherwise.